The spiritual master is always offering Krsna four kinds of delicious food (analyzed as those which are licked, chewed, drunk, and sucked). 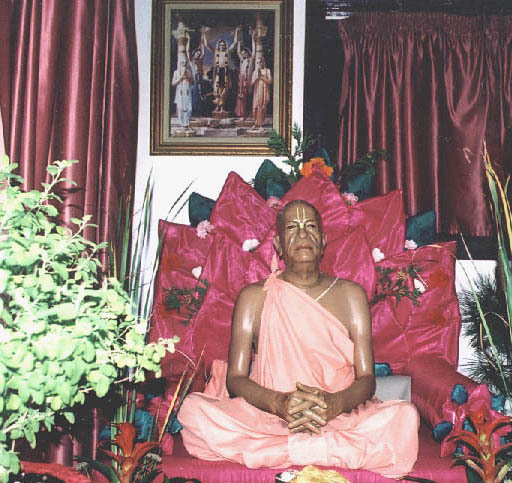 When the spiritual master sees that the devotees are satisfied by eating bhagavat-prasada, he is satisfied. I offer my respectful obeisances unto the lotus feet of such a spiritual master. The spiritual master is very dear, because he is expert in assisting the gopis, who at different times make different tasteful arrangements for the perfection of Radha and Krsna's conjugal loving affairs within the groves of Vrndavana. I offer my most humble obeisances unto the lotus feet of such a spiritual master. The spiritual master is to be honored as much as the Supreme Lord, because he is the most confidential servitor of the Lord. This is acknowledged in all revealed scriptures and followed by all authorities. Therefore I offer my respectful obeisances unto the lotus feet of such a spiritual master, who is a bonafide representative of Sri Hari (Krsna). By the mercy of the spiritual master one receives the benediction of Krsna. Without the grace of the spiritual master, one cannot make any spiritual advancement. Therefore, I should always remember and praise the spiritual master. At least three times a day I should offer my respectful obeisances unto the lotus feet of my spiritual master."